The pop culture fun times will continue this summer, right into late August. Find your slice of pop culture bliss in the desert over the final weekend of August 2017. 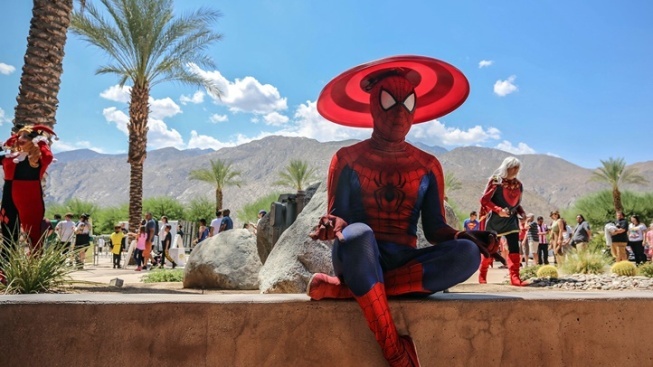 COMIC CON PALM SPRINGS: Oh yeah, that's coming up on the summer fun times calendar, too, and it has some mondo highlights, like an appearance by Marvel Man Stan Lee as well as the Complete Stan Lee Museum Exhibition. A concert featuring Lynda Carter is another centerpiece to the three-day to-do, which is on from Friday, Aug. 25 through Sunday, Aug. 27 at the Palm Springs Convention Center. As for the shop-a-bility outlook? Prepare to browse 450+ vendors for all of your comic book, toy, t-shirt, and poster needs (and a caboodle of other merchandise types, too). A Zombie Walk, a Zombie Maze, a flick themed to the moaning undead, and other shambling-specific happenings are on the roster as well. And a big slice of the action? Cosplay, of course, so, honest, have your awesome outfit set to go. FOR ALL OF THE STARS... set to show at the desert delight, such as Tom Kenny (Spongebob!) and Lindsay Wagner (the Bionic Woman! ), best shamble, like your favorite zombie, to the convention's informative site before August draws too near.